Now I have never been a big fan of superhero shows, but after watching 'Arrow' that is now a different picture. One of the hottest and most talked about U.S shows has shot on to Sky 1. Starring Stephen Amell as Oliver Queen, a billionaire whose life is shook up after being stranded on a remote island for five years. When he returns back to his hometown, Starling City, Oliver is a man on a mission with an agenda to right the wrongs his father did while building the Queen Empire. Facing up against criminals that have done wrong to Starling City with a bow and arrow can be difficult at times. With a family that do not understand their new and distant son and a complicated love life, fighting crime comes second best at times. Thankfully John Diggie, Oliver’s personal bodyguard (David Ramsey) is here to help and keep Oliver on track. John has his own agenda for helping Oliver - his brother was killed by one of the many criminals that have destroyed Starling City and John is out for vengeance. As I watch 'Arrow' I fear with all these secrets, questions and remote islands this could soon turn into 'Heroes' - full of questions that will never get answered, and you realise that you have wasted years trying to find closure to a television show. This re-invented DC comic book super hero has made a big impact and will continue to be a big hit as series two has already been commissioned in the USA. Whether or not 'Arrow' will last as long as 'Smallville' did, is something only the future can tell but right now I believe it has the potential. It is one of those shows that has you gripped from the first episode. 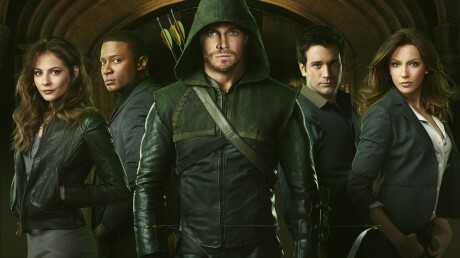 The new episodes of 'Arrow' start back on Sky 1 on the 29 April '13. 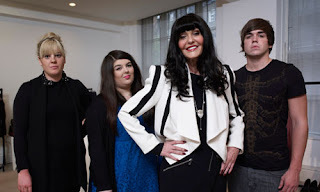 With a struggling economy and with it harder for the younger generation to gain work, former 'Dragons Den' star Hilary Devey is here to help with 'The Intern'. Each week Hilary gives a three young people the chance to earn their dream job and start climbing the career ladder. They are set the ultimate week’s trial from hell to test their nerve and to see if they can really hack it. With actors and staged scenes all over the place this could be a recipe for disaster. One of the tasks in each episode involves a celebrity....and I use the term celebrity very loosely. In the first episode Hugo Taylor from 'Made In Chelsea' has been handcuffed to a bed by his girlfriend and needs to be released. Now if that were me, I would have had to have taken a photo and posted it on Twitter, which I know is not the right thing but that is me! But these hopeful employees have to act professional even if the situation seems weird and slightly staged. Hilary Devey with her husky voice and interesting facial features would truly scare me as a boss. After every task Hilary is on hand to give her predict on how they did, which can mean her literally telling off the interns and being quite cut throat. If I was in the room with her, I'd run a mile but watching her on TV just makes me burst out laughing. As much as the situations are clearly staged with soap opera acting it is a real joy to watch a show that helps young people try and succeed in the business world. I am kind of shocked though 'The Intern' is on Channel 4 and not on E4 where it would seem like a better fit. Catch 'The Intern' every Thursday on Channel 4 at 9pm, or catch up on 4oD.